HuntersTrailhead Featured Elk Hunts - Elk hunts across the western US. Draw, Landowner, Over the Counter tags. Reasonably priced combo hunts are a rarity today. However, this outfitter is breaking the mold with these hunts. Fully outfitted and guided hunts for Mule Deer, Elk and Black Bear for about what most outfitters charge for only one species. All licenses and tags can be purchased over the counter or online. Guaranteed tags on one of Idaho's most sought after hunting units. This outfitter has a number of tags through the outfitter allocation system assuring hunters the necessary tags to hunt this area. Great trophy potential with extremely high success rates. This outfitter has leased a number of ranches ranging in size from 9,000 acres to over 100,000 acres. Each ranch contains prime elk habitat with good elk populations. Tags must be drawn, but historically have been guaranteed to anyone that applies. These hunts book quickly and may require a years wait. Near 200 square miles of wilderness and forest land are this outfitters exclusive guide area. With 40 years of experience and numerous record quality bulls to their credit makes this hunt a must consider. Easy tags to draw or purchased as a left over make this a hunt that can be booked this year. Lodge accommodations with 4x4 access to the hunting area. A 10,000+ acre private ranch is the base for this hunt. Meals and lodging are included with this hunt. This ranch is located in New Mexico unit 4 and holds a large population of elk. Road access is available throughout the ranch and hunters are encouraged to bring their own ATV's. Unit wide self guided landowner vouchers. Units 6C, 13, 45, 52 and 53 archery, rifle and muzzleloader hunts available. Unit 15 unit wide muzzleloader landowner voucher. Fully guided hunt including meals and lodging. Unit 13 muzzleloader private ranch fully guided hunt including meals and lodging. Private land hunts and landowner vouchers are available through this outfitter or public land hunts via the annual drawing. Hunt the Gila units for trophy class bulls. 300 to 330 class bulls are typical with some much larger being taken each year. These vouchers do not last long so book your hunt early. Private land hunts with guaranteed landowner vouchers. Unit 46 consists entirely of private land so no tags are offered through the annual drawing. This outfitter has leased multiple ranches throughout this unit and has exclusive hunting rights. Gentle terrain with high hunter success. Utah limited quota and over the counter hunt options are available with this outfitter. Typical bulls on the limited quota areas score in the 300 - 360 range with respectable 5x5 and 6x6 on the over the counter hunts. Guided cow hunt on an 18,000 acre CWMU near Current Creek Reservoir. Guaranteed tags and hunts are guided 2x1 prior to the regular hunting seasons. Hunts occur each weekend during August. Utah landowner cow elk vouchers. These cow tags are valid on a ranch that borders the Henifer-Echo Wildlife Management Area and can be used until the end of January. Hundreds of elk use this ranch as a wintering grounds and success rates have been very high the past several years. This is a great hunt for those looking to put some meat in the freezer. Guided cow hunt on an large private land in the famed Book Cliffs of eastern Utah. Guaranteed landowner vouchers, meals and hotel stay all included in hunt rate. Hunts occur November to January. Guided hunts deep in the Wind Rivers Wilderness. This outfitter operates 2 elk camps 12 and 26 miles from the trailhead and is the only outfitter in the area. A general season tag is required for this hunt, and one point is usually enough to draw in the standard drawing. Buy a point in August and hunt in October the next year. Great 6x6 bulls are typical with the elk frequently still bugling during the rifle season. Hunt along the east border of Yellowstone National Park. Horseback wilderness camps for trophy quality bulls and hotel hunts for cow elk. Easy to obtain tags whether you want bulls or cows. 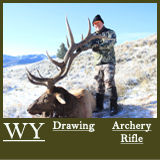 Trophy class bull elk hunts in units 62 and 63 on the eastern slope of the Absaroka Range. Wilderness horse back camps or modern lodge accommodations. Combination hunts are an option with this outfitter.